We want your experience to be happy. We stay away from negative ads, but I want to remind or inform our families about breeders that sell mixed breeds (aka designer dogs) or sell many breeds. If someone’s ad shows many breeds or many puppies, they are probably a broker, which means they do not know where the pups are raised or where they come from. Or they could be puppy millers, who raised hundreds of dogs in undesirable conditions. Brokers and Puppy Millers do not health test and do not raise their dogs in their home.The dogs can live in miserable conditions. If you have questions about us call our Vets, our dogs are in our homes, sleep on our beds and get great Vet Care. Dr Schultz and Riverfront’s Dr. Lisa know us well. We guarantee our pups for life threatening genetic defects for one year. We will be here to support you and back you up. If you read someone has a longer guarantee and have not been in business very long, they may not be here to back up your guarantee. Having said that, we like to talk about VanCort’s Havanese and all the great things we do to we provide you with healthy happy pups and support you in your new family experience. AT anytime in the future if you need to place the pup in a home contact us. 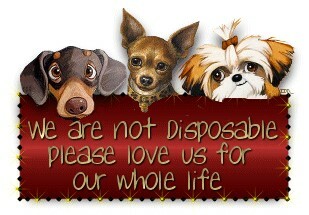 We love them and never want them to enter a Pound or Rescue. We do not sell with full registration, our pups are for families! 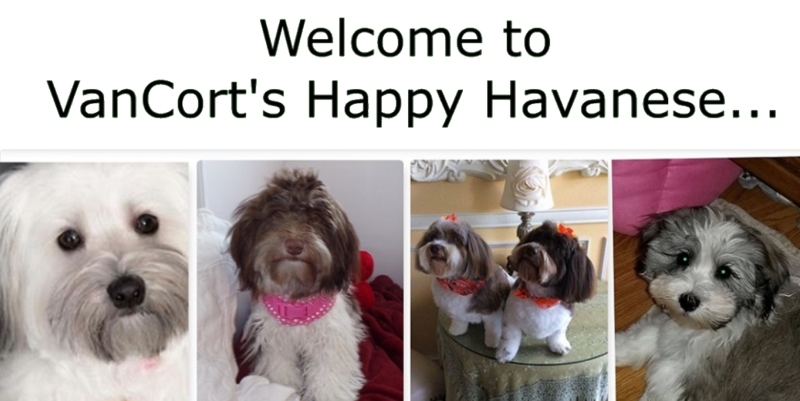 VanCort’s Happy Havanese puppies are available on a first come first serve basis. You may reserve a puppy by placing deposit of $500 by way of a personal check, or Pay Pal, which will be credited to the price of the puppy. This deposit will place you in order of receipt for choice. 1st deposit gets 1st pick of the litter and so on. If you would like to pick up the puppy at our home, the balance will be due at that time in cash. If we make arrangements to meet halfway, a deposit and we may require a delivery fee depending on the distance (over 100 miles), and the remaining will be due in cash upon arrival. Our Adults have been are Micro Chipped, so that they can be identified by AKC. AKC has inspected and loves our dogs and the great conditions they live in. Your new baby will come home wormed and up to date with first shots. The Vet checks them over completely to make sure the hips and patella’s are fine and the general pup is healthy. They also check their hearing. We puppy pad train puppies and teach them to go outside. We recommend you use Blue Buffalo Chicken and Rice, Nutri Source Small and Medium breed puppy(they have a website to find locations). If that is not available you could try Iams Puppy Chicken(not Lamb) or Nutro Natural Choice Chicken. This where we buy LOTS of products. We use exercise pens from Walmart.com, you can buy them at toys R Us/babies r us or order them from www.petedge.com They open into a rectangle. I put puppy pads on one end and a blanket bed area on the other end. This gives them room to move during the day. They can stay there all night or all day while you are at work. Crates are very confining, can cause them to get territorial with humans. 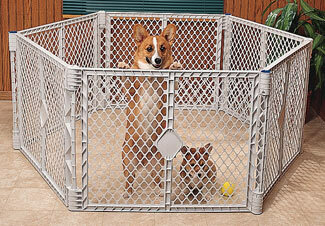 Some pets will nip if crated long period and a person reaches into”their space” the crate. Pens are also a safe/time to settle down. We have even used them on top of carpet by placing a section of vinyl under the pen. We use puppy pads. The pups, play with small stuffed toys, squeaky toys and I let them play with flat rawhides (take them away when they get small). Our young pups are raised in pens, they are children’s exercise purchased at Babies R Us or many pet stores and sites. A spay and neuter agreement. They will have their 1st round of shots and have been wormed, and a vet record of such. They are given Panacur at age 6 weeks. 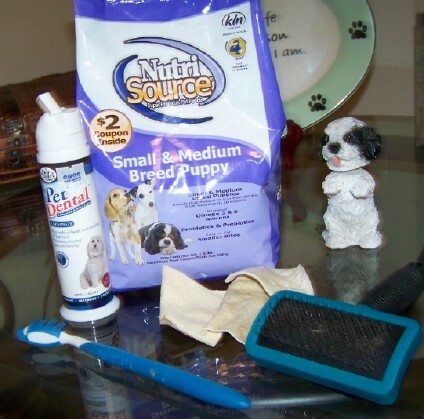 Nutri Source Small and Medium Breed Puppy -Dry food. Have on hand a high quality Chicken and Rice Canned Puppy food in case the pups is being a fussy eater at times. We use Science Diet. We use hospital underbed pads as puppy pads. Fabric pads can be purchased on Ebay under Whelping pad or from Petsmart. I use regular baby shampoo. If you have any allergies, our pups have hair rather than fur which is great for those with allergies, you could react from their shampoo, you may want to make sure the puppie’s shampoo is fragrance free. I give them a shower at this age rather than a bath. I hold them with my left hand and wash them with the right, then rinse. Be careful to avoid water in the ears, dry that area carefully. They usually are still receiving moistened food. I take their puppy food and moisten with water, just enough to make the kernels spongy. Blue Buffalo chicken and rice puppy. Use chicken for pups, lamb can cause tummy upset. Feed your new baby and take outside immediately after. They need to potty upon waking and after eating and before bed. Always praise! They are so smart they learn quickly. Pups have played with small balls, stuff toys and flat unflavored rawhides. At 8 weeks feed 3 times per day and at 12 weeks 2 times per day. Start with 1/2 a cup and see how the pup does. They are still babies, they need direction, training consistency and love. As babies they sleep most of the day and play hard when awake. I recommend the use of a child’s exercise pen for these rest period. Some people sleep with their puppy and others prefer pup sleeps in their pen. If can take a little while for them to adjust to night time. It is nice if they can hear you speak. I usually just say “It’s ok I am right here”. They calm down. Remember we are here to support you! A puppy class is fun and it teaches the family what commands to use etc. We are available for our families. Email is the best for me. I work during the day and can get back with you on my breaks etc. The phone on the site is Charley’s and Patrick’s they are with the dogs full time. Havanese are natural companion dogs: gentle and responsive. They become very attached to their human families and are excellent with children. Very affectionate and playful with a high degree of intelligence. These cheerful dogs are very sociable and will get along with everyone including people, dogs, cats and other pets. They are easy to obedience train and get along well with other dogs. This curious dog loves to sit up high on a chair to observe what is going on. It is very sensitive to the tone of your voice. Harsh words will only upset the dog and will achieve very little. The Havanese have a long reputation of being circus dogs, probably because it learns quickly and enjoys doing things for people. Few tend to bark a lot, as they can be taught not to do this. It is not their nature to bark a lot. It is best to teach them not to bark unnecessarily while they are still young to prevent it from becoming a habit. Havanese are good watch dogs – making sure to alert you when a visitor arrives, but will quickly welcome the guest once it sees you welcome them. Havanese live for your every word and gesture. They should be neither timid nor aggressive. It shows no cowardice, in spite of its size.